After a gruelling audition process, Ella Bangs is about to experience an adventure most of us can only dream about, writes Roger Collier. For Ella Bangs, a 10-year-old on the brink of a magical journey, it all began 10 months ago in the kitchen of her Orleans home when her mother pushed play on the answering machine. "I'm listening to this message," says Lauree Bangs, "and my jaw is on the floor." Her daughter, Ella, standing nearby, wondered what had gotten into her mother. "I thought we won the CHEO dream home," she says. The message had been left by Julie Barron, a talent scout for Cirque du Soleil. She wanted to know if Ella was interested in pursuing the role of Zoé, the lead character in Quidam, a show that has been touring the world since 1996. Interested? Oh yes, Ella was very interested. Two months and three auditions later, Ella landed the part. She will soon be flying to Shanghai to train and then to Mexico to join the tour. And her entire family is going with her. While Ella has never done anything quite like this, the bubbly girl with braces on her big smile is no stranger to the stage. Ella and her 12-year-old sister, Tessa, have been performers for more than half their lives. They enter fiddling and step-dancing competitions all over Ontario and the northern U.S. And they enter to win, which, as evidenced by the nearly 100 titles they've accumulated, they often do. When they aren't performing themselves, the sisters enjoy watching others perform. In spring 2006, they watched a talented troupe display its skills at Lansdowne Park. The troupe was from Cirque du Soleil. The show was called Quidam. The sisters were enthralled by the story of Zoé, a neglected little girl who is given a hat by a mysterious stranger, a hat that allows her to enter a magical world. As they walked to their car after the show, Ella turned to her sister and said, "Wouldn't it be cool to be in a show like that?" Also that spring, Michael Zaugg, the music director of the Cantata Singers of Ottawa, was looking for fiddlers for an upcoming show called Canadian Soundscapes. A woman he met in a store recommended Ella and Tessa. Mr. Zaugg contacted the Bangs family and, soon after, visited their home to see the girls play and dance. He brought along his wife, Julie Barron. "They were very cute," says Ms. Barron, "and very capable." Mr. Zaugg, also impressed, invited the sisters to participate in Canadian Soundscapes. On May 27, 2006, they performed a 10-minute set during the show, held at Christ Church Cathedral. "This set was worth the price of admission all by itself," touted the review in the Citizen the following day. A couple of months later, Ms. Barron accepted a position as a talent scout for Cirque du Soleil. One of her first tasks was to find a new lead for Quidam. "Ella just popped into my mind," she says. She called the Bangs home, but they weren't there so she left the message that started it all. When Mrs. Bangs called her back, Ms. Barron stressed that winning the part wouldn't be easy. It involved singing and acting; Ella had done neither. And many other girls were auditioning for the role, some from as far away as Russia. Ms. Barron believed Ella had talent, but didn't want to give the family false hope. She asked them to make a video of Ella singing and send it to her. Ella's father, Bob Bangs, a musician who has played in bands for years, helped with the demo. Ella recorded three songs: a hymn, a bluegrass number, and Paper Moon by Nat King Cole. Ms. Barron was impressed. Ella's lack of vocal training was evident, but so was her natural singing ability. "It was like watching a colt find her legs," says Ms. Barron. In mid-November, Ms. Barron sent Ella the lyrics and music to five songs from Quidam. She asked the girl to learn the songs, record them and send her a new demo -- in a week-and-a-half. The day after the Bangs family sent the second video to Cirque, Ms. Barron called. She loved the demo. 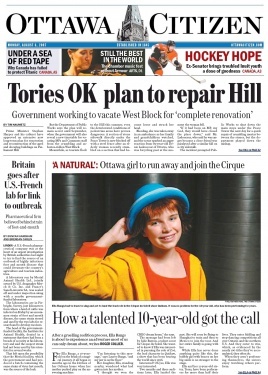 Now for the next step: She invited Ella to come to Montreal and sing at Cirque's international headquarters. When she entered Cirque's recording studio on Dec. 1, Ella's nerves began to kick in. When she began singing, Ms. Barron and an independent vocal evaluator jotted notes. Someone else videotaped her. "There was a glass wall at the back," says Ella, "and there were lots of people in there, too." But as the audition went on, Ella's nerves faded. She had performed in front of people countless times. This was no different. She settled in and enjoyed herself. "She was soft-spoken, a bit cautious," says Ms. Barron, "But she did very well. Both myself and the evaluator thought she had a natural ability. Her tuning was very precise. And she had a very genuine quality, a touching quality about her when she sang." Ella returned to Ottawa after the audition. The Bangs family waited, anxiously, to hear from Cirque. Two weeks passed. Then, on the evening of Dec. 15, Ella and Tessa were watching a movie in their living room with their father when the phone rang. Mr. Bangs answered it. "Bob, you might want to sit down," said the voice on the line. It was Ms. Barron. She told Mr. Bangs that Ella had won the role of Zoé. Ella would have to move to Montreal to train, and later travel to Shanghai to practise with the live show, before joining the tour in Mexico in the fall. Mr. Bangs flashed a thumbs up to Ella and told her the news. Over the phone, Ms. Barron heard the girls screaming. When Mrs. Bangs came home later that evening, she was greeted by Ella, who had donned what she called a "kind of Chinese-y" shirt and a sombrero. "Guess what places I'm going to?" she asked her mother. Ella moved into her grandparents' Montreal home in March. Until school ended in June, she attended classes each weekday morning and trained each afternoon. She was assigned a personal trainer, a performance psychologist, and vocal, acting and makeup coaches. At first, Ella was overwhelmed. The Cirque complex was huge; she got lost all the time. She often didn't know where she was supposed to be and had to check her schedule four or five times a day. She only saw her family on weekends, and she missed them terribly. Then there was plaster cast day. To complete Ella's costume, Cirque makeup artists had to make a cast of her head. For Ella, it's not a fond memory. "I had to sit with this plaster stuff on my head for 20 minutes," says Ella. "I couldn't see. It was scary." It didn't take long, though, for Ella to adjust. She found herself checking her schedule less and enjoying her training more. She made friends. The Cirque building, once daunting, became familiar. "It seems smaller now," says Ella. As much as she is enjoying her time in Montreal, Ella is now itching to get on stage, to put on the magical hat, to become Zoé. She won't have to wait long. On Saturday, Ella will fly to Shanghai to train with the Quidam team. In early October, she will travel to Guadalajara, Mexico, and will alternate playing Zoé with another performer. (She is too young, by law, to perform full time.) Mr. and Mrs. Bangs are taking leave from their jobs and are selling their house so the family can join Ella on tour. In addition to Ella's salary, Cirque will pay one of her parents to be her official guardian. The Bangs family doesn't know where the Quidam tour will take them after Mexico. They also don't know how long it will be before Ella outgrows the role. But Ella figures it will be a while: four years, maybe five. "I'm the youngest Zoé that they've ever had."